Championship side Bradford Bulls progress to the fifth round of the Challenge Cup after a hard fought 14-12 win over League One's Keighley Cougars at Cougar Park. Who’s in action in the fourth round? The fourth round sees teams from the second tier of the English ladder – the Championship – enter the fray. Alongside five-time champions Bradford Bulls come the likes of last year’s quarter-finalists Leigh Centurions and newly-relegated Widnes Vikings, who have won the tournament seven times. Widnes will travel to Oldham on Sunday, while the Centurions are away to fellow Championship side Sheffield Eagles. 1987 champions Halifax travel to Hunslet, Rochdale Hornets go to Whitehaven and Barrow Raiders will welcome York City Knights to Craven Park. Other highlights of the round include Batley Bulldogs’ home tie with Conference side Lock Lane, while fellow amateur side West Hull will face a stern test from the Championship’s Dewsbury Rams. The BBC will show games from each round of the Rugby League Challenge Cup live on the BBC Red Button, BBC Sport website and app in 2019. From the sixth round onwards, coverage switches to BBC One and BBC Two every weekend up to and including the final at Wembley on 24 August. All of our coverage will be available for catch-up on the BBC iPlayer. 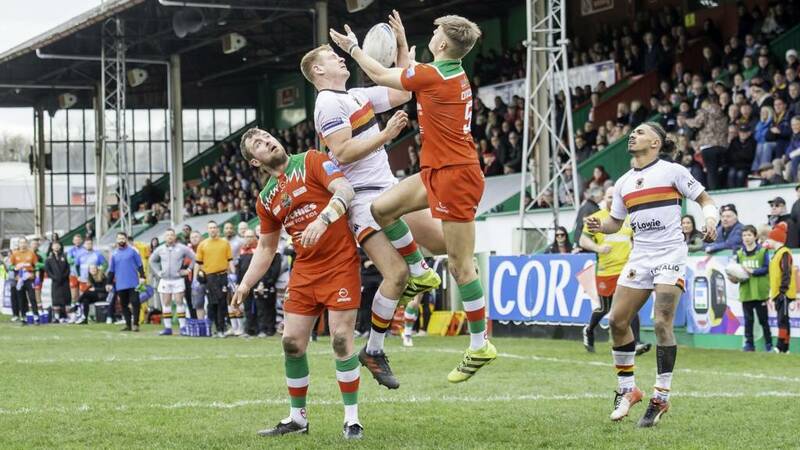 Our coverage continues today as League 1’s bottom club, Keighley Cougars, host five-time winners Bradford Bulls in the fourth round of the competition.